Years from now, our grandchildren will ask where we were during the great chill-wave explosion of 2009. If you happen to be Alan Palomo, the brains behind Neon Indian, you can confidently answer that you were at its forefront. Bolstered by blogosphere buzz and the golden touch of Pitchfork, the 22-year-old suddenly became a hot commodity after the release of his debut album, Psychic Chasms. Songs like “Deadbeat Summer” and “Should Have Taken Acid With You” took deceptively low-fi bedroom noodlings—complete with 8-bit flourishes from video game systems of yore—and wrapped them in gauzy, psychedelic electronica. Critical acclaim, constant touring, and a collaboration with The Flaming Lips soon followed. 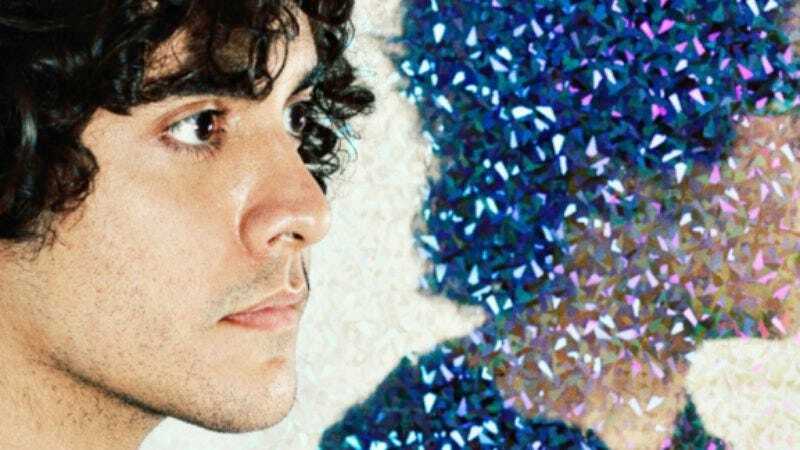 Two years after his breakout success, Palomo has finally put the finishing touches on Neon Indian’s sophomore album. In advance of the group’s show this Thursday at the Church, The A.V. Club caught up with Palomo and discussed smoking synths, Sega Genesis, and the Werner Herzog nightmare that is Helsinki, Finland. The A.V. Club: You didn’t really start playing music until college. What eventually pushed you to become a musician, and an electronic musician at that? Alan Palomo: I always had an interest in electronic music, and there were a couple of little Casio distortion pedal experiments that went on at the end of high school, but nothing that really solidified into any recordings. I think it came out of the frustration I had with the film program at my college, where the first two years were spent just learning theory, and there were no actual, real-life, practical applications. Just wanting some sort of immediate, creative outlet made me think of music. Because there is a sort of strange immediacy upon the completion of a single song. With film, it’s a little different—there’s more long-term planning, and it’s more collaborative. So there was something I really liked about just sitting in a room with a couple of synths and hashing out some stuff. AVC: I had a similar experience in film school. They wouldn’t let you lay a hand on any equipment for two full years. AP: Yeah, it sucked. It was the worst. And on top of that, they would add insult to injury and make you take a bunch of preliminary classes that didn’t have anything to do with your major. It was their system for weeding people out. So if you really wanted to do it, you had to take a couple of Spanish classes or history classes while you were at it. AVC: What drew you to such low-fi, 8-bit sounds? AP: Well, it’s not until you witness it in retrospect that you’re able to see how a particular gaming console has any sort of aesthetic significance. It’s strange how 8-bit has become a phenomena among certain circles. On the record, I got it in my head that I wanted to generate a lot of sounds that were 16-bit, which is what you’d find on the Sega Genesis. And there are certain Yamaha synths from the ’80s that the sound card in the Sega was based on. I would essentially hunt for these and try to generate the sounds in my head that were synonymous with the Sega Genesis. Those sounds were always in the background of my childhood. To this day, some of it is the most unabashedly romantic songwriting. It’s almost accidentally touching on these theta points in music. They’re trying to replicate certain pop songs, and there’s always something slightly off about it. But it’s meant to serve as a background piece, so there are all these really strange indulgences. AVC: Has your live show changed much since you first started playing? AP: It’s undergone a slow transformation. Originally, the purpose of performing these songs live was just to nail them. The goal was just to learn them and have it be a cohesive show and not a complete disaster, like our first 10 shows. [Laughs.] But because of all the touring we did, it began evolving out of the desire to keep it fresh and interesting for us. In a strange way, “Deadbeat Summer” just became this white noise over time, because I would hear it in so many different incarnations every single night. That was partly my motivation to bring in the live players that I did, because Jason [Faries], Leanne [Macomber], and Ronnie [Gierhart] all had very different musical sensibilities. They were all coming from their own angles, so they would inject these ideas into the songs that perhaps I wouldn’t have thought of. But it was definitely pretty potent. Over the course of eight months, songs just transformed into something else, and they still continue to. It’s just a way to keep the experience of performing a song feel authentic— especially some of the songs that feature samples. The samples have slowly been discarded from the live show, just out of the necessity to feel like you’re creating something that’s immediate and of the moment. AVC: What made those first 10 shows such disasters? It’s interesting—only just a few years ago, you could be a band that would have these kind of shows and no one would really hear about it, and eventually you would evolve into some other thing that would be a little more palatable. But when you’re coming up on the internet—I mean, I can still find that video on YouTube. But that sort of stuff motivates you, too, because you have a catalog of the evolution of your performances. AVC: You’ve said Psychic Chasms drew on your recent past for inspiration. What inspired your upcoming album? AP: With a second album, the narrative always becomes a dude that’s on the road all the time. Obviously, there are only so many songs you can write about a highway. I think when Animal Collective wrote the song “On A Highway,” that was pretty much as far as you could go with that sort of thing. Coming from a place that didn’t have such a specific narrative as Psychic Chasms, it almost began to become a fantasy-based thing. But at the same time, the process I used to write the record was to go to Helsinki, and just stay there for two months. I went there at the time of year where it peaks as far as the least amount of sunlight. So I just fell into this sensory deprivation tank, and just lost my mind. [Laughs.] For a while, it became this strange, Werner Herzog nightmare. Even if the narrative isn’t necessarily the same, it’s only in isolation that you start having conversations with yourself again, and you remember what it’s like to be by yourself. And that never really changes. You have the same attributes whether good or neurotic. It’s for better or for worse, all just there, and almost deafening. It’s just you with your thoughts for so long. And I think that was what really fueled the record.